The Academy Award for Best Animated Feature has become a serious prize, not just a nod to animation from a group that only considers dramas worthy of praise. The Academy does tend to spurn other genres, keeping comedies far away, over-looking sci-fi, completely ignoring horror. But at least they have allowed that animated is an award-worthy art form, that films in this style often have just as much to say as heart-breaking dramas, that the work put into these film is, alone, impressive. So, since 2001, an Academy Award has gone to an animated film, some even bleeding into the Best Picture category. Last year Inside Out was the big hit, and before that some of the standouts were Big Hero 6, Frozen, Brave, Up, WALL-E, and Ratatouille. This year, Zootopia hopes to be the animation on everyone’s mind, and if you haven’t seen it, here’s a spoiler; it will be. Animals have a bright future ahead. Not only will they evolve into walking, talking beings who create cities of their own & build a utopia in which to live, but the predators among them will set aside their carnivorous urges, eat veggies along with everyone else, and no longer terrorize the natural world. Animals will live together in peace, at least usually, and with a few exceptions. Some former prey will hold on to their ancestors’ fear of predators, never trusting the foxes, weasels, and panthers of the world. Not Judy Hopps though, she sees each animal as equal, wants all creatures to join together in harmony, making the world a better place one day at a time. 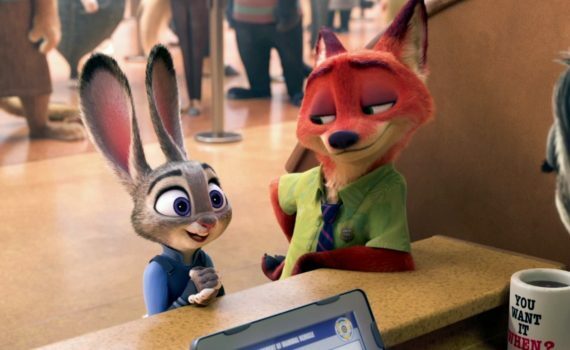 Judy becomes Zootopia’s first bunny cop, an asset to the force & a force for good. But when some predators begin to “go savage”, Judy will realize that even she has prejudices, antiquated judgements that will hold her back from solving the case and saving the city. It’s not an exaggeration to say that Zootopia has one of the strongest moral messages of any animated film ever made, that it is one giant statement on the way we treat each other, judge each other, and create predisposed assessments of those who are different from us. While Inside Out had an emotional message, Zootopia has a social one, one that’s both obvious & important. Watch it with your kids, your parents, your friends, it doesn’t matter, just watch it, and try not to be affected, I dare you. That said, I can’t say that I loved the film as much as I have loved others, like Inside Out or WALL-E. The animation is breathtaking, the story is awesome, the pace is fast & fun, the characters are great. I just didn’t fall in love, my heart wasn’t into it, the movie was more smart & impactful, less touching. That’s not to take away from its success though, and I do think it will be nominated for Best Animated Feature this year, I’m just not sure it will also be nominated for Best Picture.